Just to enable anyone who is reading this to go away quickly if they don’t share my interests, these are some things I like and don’t like (not necessarily in order of preference). People being what they are, these are the topics I am likely to want to write about. Hopefully more on the things I like than the ones I don’t. Also the likes and dislikes of the other members of the household which I am sure will come up. Like – Tech in general, cats, mountains, cookery, alternate history, Scotland (where I live), Highlands or Shetland (where I would like to live), MS Surface, swans, WP 8, cats, Pathfinder, Web App Testing, Art Deco, PowerShell, cats, India, wildlife (of all sorts but particularly the Scottish variety), VBA, World War II, Microsoft. And I really like cats…. Dislike – Luddites, political correctness, big cities (as places to live), chocolate, Google, NSA/GCHQ, flying, reality TV, celebrity gossip magazines, adverts, hackers and pseudo-hackers. I like cats though. And Swans. people, sleeping, Bagpuss (of which more later), game for a cat on the iPad (no taste), stealing chairs, newly made beds. Dislike – Vets, cars, dogs, other cats, each other (sometimes), hedgehogs, toads, rain, water in general, Hitler (of which more later), snow, wind, bad weather in general, baths, closed doors. My husband R may also get an occasional mention. Likes – Tech in general, cats, Ruby, Linux, iPad, Apple, burgers, comics, Sci-Fi, Pathfinder, Web App Testing, iPhone, PowerShell, Wireless Testing, Security in general, cats, computer games, chocolate, our Jaguar XF, Twitter. He really likes cats too. 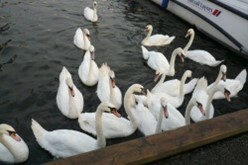 And Swans. Dislikes – Seafood, house cleaning, Python (the language not the snake), people who make him late for things, weird tests of things neither of us have heard of because he always ends up with them, shopping, catching live mice at 3am.